There are fashion photographers, and then there are fashion photographers. Horst P. Horst—born Horst Paul Albert Bohrmann in Germany in 1906, and known to the cognoscenti merely as Horst—is one of the photographers who invented the fashion editorial form, producing heaps of iconic images over the course of his sixty-year career. Books and museum exhibitions have been dedicated to Horst, who arrived in Paris in 1930 to apprentice to Le Corbusier, and shortly thereafter jumped ship to begin shooting for Vogue Paris, but perhaps there's no better affirmation of his legend status than this: In the video for her song "Vogue," Madonna recreated Horst's most famous image, a shot from behind of a woman wearing a partially-unlaced Mainbocher corset. Truly, Horst's influence is everywhere. As well as shooting fashion, Horst was well-known for his photography of architectural ruins and sumptuous interiors (including his own.) He brought both interests to bear on the campaigns he lensed for Valentino in 1983. 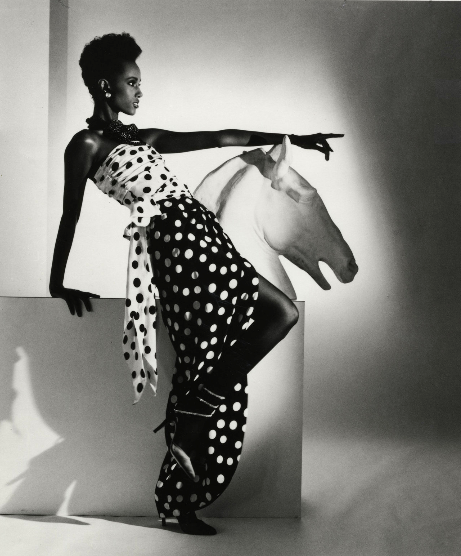 His image of Iman for the Spring/Summer 1983 Ready-to-Wear, sets off her black-and-white polka-dotted bustier gown against a sculpture of a horse done in the Classical style, while the Horst shots of Mounia for the Fall/Winter Ready-to-Wear of that year trade between a snap of her lounging in a luxe drawing room in Rome and another one of her posing with a Roman-style bust that might have been scavenged from the Campanile. All the campaign images are in black-and-white—some crisp-looking, others naturalistic, yet others marked by Horst's trademark moody chiaroscuro—but all of them exude, as Mr. Valentino put it, Horst's "sense of style that is unique, upbeat [and] decidedly eternal." These Horst images are well-worth revisiting now, not only for the plain pleasure of seeing a photographic master at work, but also because 1980s aesthetics are recurring on today's fashion runway. Iman, in her polka-dot gown, and Mounia, in her doorknocker earrings and turban, appear oh-so-on-trend right now. 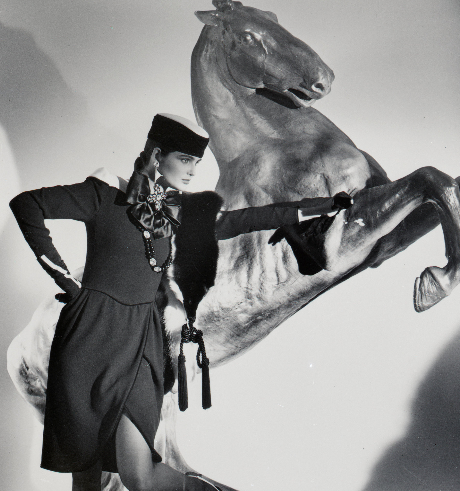 Of course they do: Horst P. Horst and Mr. Valentino both know a thing or two about making a look timeless.